You walk into a meeting only to be immediately received by a pack of angered faces. You look at the time, you’re a minute late. What’s the big deal? You ask yourself. It’s only sixty seconds. This is the type of mindset that puts many employees in a bad place. The fact of the matter is, it doesn’t matter if you’re a minute late or twenty minutes late. Late is late, and being late tells a lot about your character. 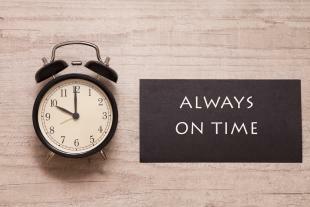 There are a few ways that can easily change your habitual lateness, and if followed, can create a huge impact on your career and life. If you don’t genuinely believe that you are punctual, you will never truly be punctual. The first part to achieving success in timing is to play the part. Tell yourself that you are punctual, and although it may seem crazy, soon enough your habits will change. As long as you keep telling yourself that you are punctual you will be. Although it is cliche, being early is the new on-time. A great way to stay on time is to pretend as though being a few minutes early is being on-time. Showing up a bit early to meetings is a superb way to show your interest and dedication through punctuality. Those who show up to meetings early and prepared often command a sense respect, and coworkers will look up to them. Early and on-time arrival to meetings also signifies your respect for others, and can be equally returned. In addition, being punctual to meetings demonstrates a sense of organization that is only conquered by those who think and plan well in advance. Anyone can be on time for a few meetings here and there, but it takes a truly devoted and organized employee to perfect punctuality!